Antari Fog Chiller Low Lying Machine DJParts - All Variety of Parts that DJ Needs. 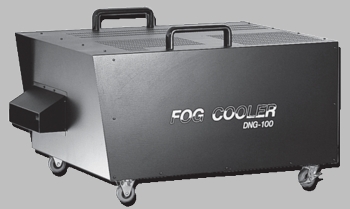 When connected to any fog machine, the DNG-100 Fog Cooler produces a low- lying smoke whose effect is virtually indistinguishable from that created by dry ice. The DNG-100 converts normal fog to a floor-hugging cloud of dense, white fog. This is accomplished by cooling the temperature of the fog produced by any regular fog machine to a point where it falls to the ground. The DNG-100 is extremely easy to operate as there are no external controls on the machine. Simply plug the unit in and place the fog conducting hose from the output of any fog machine to the input of the DNG-100 The unit is fully operational upon being plugged in. 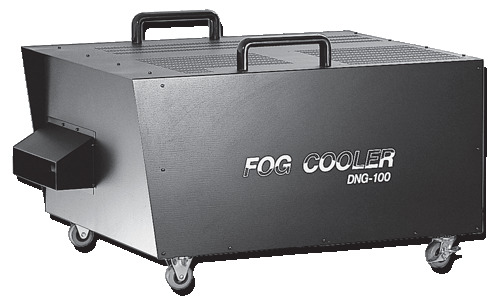 The volume of fog produced is controlled by the fog machine that the DNG-100 is attached to. With the addition of the optional second fog conducting hose, the ground fog can be placed anywhere within 10m of the DNG-100 output nozzle.